On the outside reef slightly to the north of the corner, is a conglomeration of coral rocks at 15 meters with masses of reef fish of every description, hence giving the site its name. 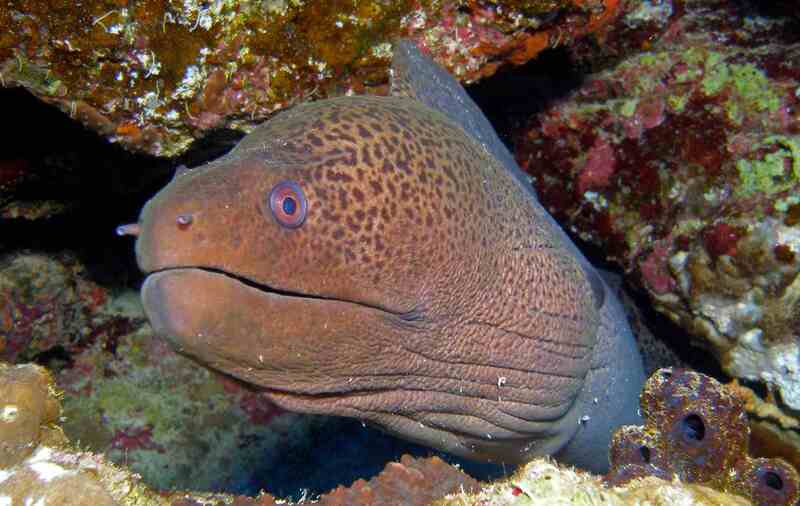 There are also many moray eels at the rocks and on the sand bottom at 25 meters are white-tip reef sharks and stingrays. A couple of caves at 25 meters are worth a look. The corner sweeps back more than 90˚ into Lhohifushi Kandu across a gradually sloping reef covered in soft coral to a cliff inside the channel. The reef inside is full of caves from 15 to 25 meters, and a long drift is well worth the experience. There are many moray eels at the rocks. 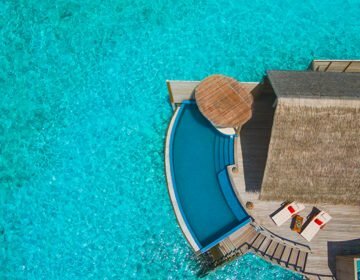 Like Kani Corner, currents can be fierce at the entrance, and special care should be taken on the acute corner of Lhohifushi as currents can drag divers away from the reef. 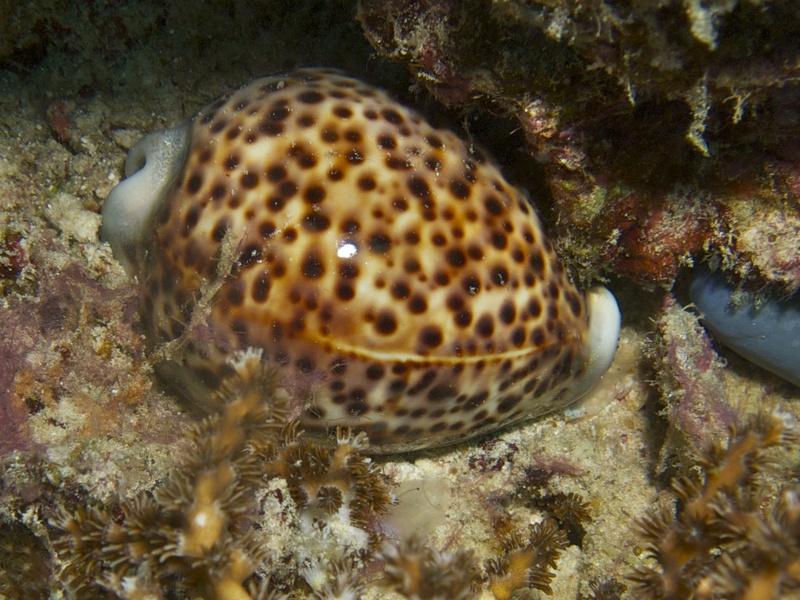 Kani Corner is one of the most exciting drift dives in the atoll. The outside reef bottoms onto a sandy slope at 30 to 35 meters where white-tip reef sharks and eagle rays can be seen. During the south-west monsoon, mantas return to coral rocks at 25 meters. The corner to the channel is marked by a small ledge with a cave at 25 meters. Around this point are a variety of schooling fish like snapper and fusilier and pelagics such as great barracuda, blue-fin jack, and dog-toothed tuna. Napoleon meander about this area keeping a watchful eye on aquatic intruders. Soft coral is prevalent on the gentle slopes of the reef corner, and higher up at 15 meters are coral rocks with aggregations of oriental sweetlips. 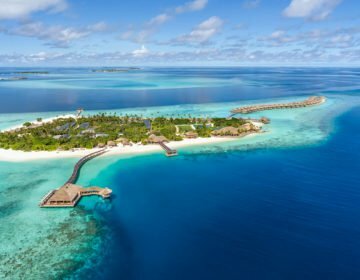 Inside the channel, the reef banks up to a sharp drop off between five and 20 meters with caves and overhangs down the face, continuing in this fashion through the long Lhohifushi Kandu. Currents flow mainly into the channel during the north-east monsoon and mostly out during the south-west monsoon. They can be exceedingly swift in this narrow passage and divers may encounter plenty of turbulence here, as well as the prolific marine life. Care should be taken with a strong outgoing current. Divers are wise to start well inside the channel if diving at these times and to stay close to the reef and shallower on the corner. Opposite Gasfinolhu on the outer reef edge is a small sandbank with one coconut tree growing on it. Alongside is Palm Reef. The best diving is around a series of coral rocks between 10 and 20 meters where reef fish including parrotfish, Moorish idol, surgeon, angelfish, and snapper all gather. Nurse sharks are often seen under the ledges. Around the base of the rocks, goatfish are found rummaging in the sand and rubble and on a sandy plateau at 20 meters on the southwest side of the rocks are several white-tip reef sharks. Nurse sharks are often seen under the ledges. This is an easy beginner dive with a maximum depth of 20 meters to the sandy bottom. Old Virgin lies on the outside reef, slightly north of Lhohifushi. It is an arch in the reef at 10 meters through which divers can easily swim. The reef edge has many crevices and small inlets in the shallower depths where reef fish find protection and delicate hard coral grows. 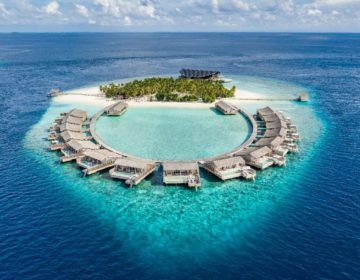 Thaburudhoo channel has a great deal to offer divers. The long reef on the south side of Thaburudhoo Kandu guarantees plenty of options for divers. On the outside are grey reef sharks while inside the channel, Coral Garden is an excellent dive suited to beginners with a maximum depth of 18 meters. The coral along this reef is stunning, and a multitude of small reef fish live among it. Located in the center of Thaburudhoo Kandu is a reef that peaks at 17 meters. The bottom of the channel is 25 to 30 meters. The reef top has a good covering of soft coral, and sea anemones and in the caves are sea fans. 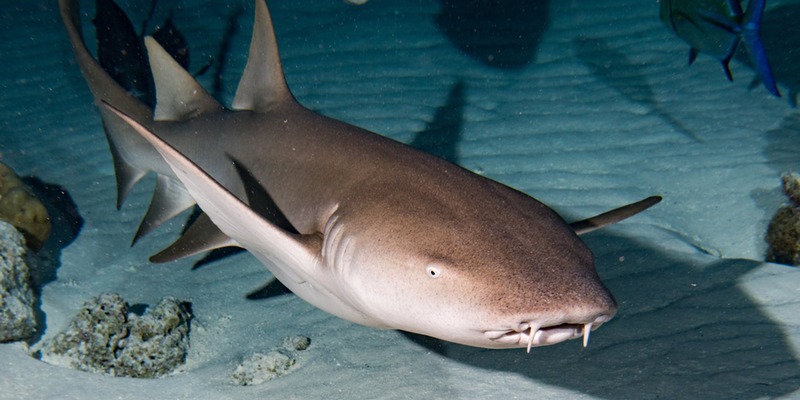 Nurse sharks spend some time of their daylight hours in these caves. It is a long swim of about 75 meters across the channel to the reef but well worth the exercise. Care should be taken with currents, especially outgoing ones. HP Reef is another exceptional dive with a spectacular reef formation. The entire length of the reef on the southwest side is filled with outcrops of reef, caves, and crevices. At the northwest side is a large outcrop of rock divided from the reef by a narrow sand channel. The outside of this rock drops steeply from 15 meters to a large cave at 24 meters. The ceiling of the cave is adorned with blue coral and at one end of the cave is a narrow swim-through called the ‘chimney,’ leading to the top of the rock. The soft coral and sea fans clutter the sides of the cliffs and overhangs and are nourished by the strong currents streaming through Himmafushi Kandu. Large schools of big-eye trevally and blue-fin jack, rainbow runner, barracuda, and dog-toothed tuna make this reef a playground for pelagics. Grey reef sharks and eagle rays join in the action and yellow-back fusilier concentrate here in big schools. On the reef, top are many species of angelfish such as the three-spot, emperor and regal angelfish. Masked bannerfish swims around the hard coral on the reef top along with many other reef fish. 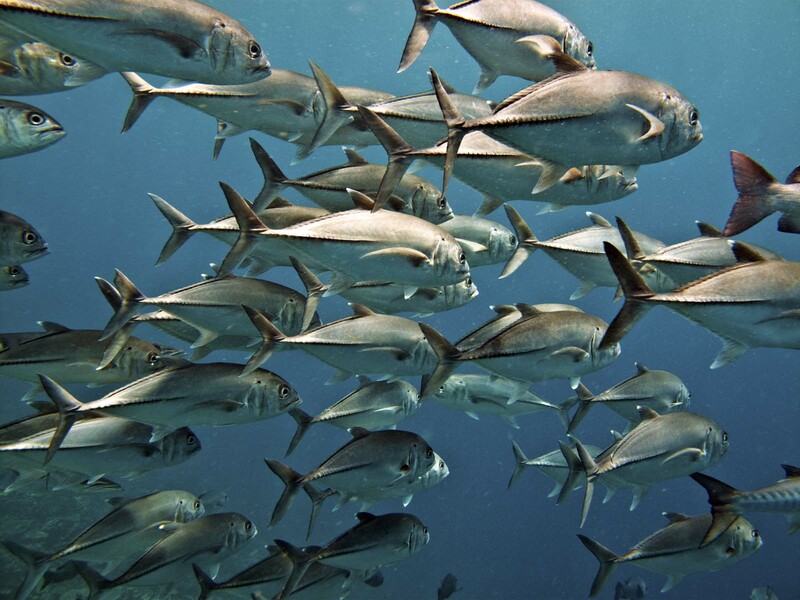 Large schools of big-eye trevally (seen above), barracuda, and dog-toothed tuna make this reef a playground for pelagics. Currents can be strong and should be respected. A safety balloon is a necessity for making open water safety stops if there is a current. Girifushi is under the control of the National Security Service. Diving is prohibited when the red flag is flying from the jetty. This spectacular site has many different features and can be dived in some ways. It is one of those sites that seems to get better with every dive. There are three sections of the reef to this Thila, the smallest reef being no more than 10 meters in diameter, while the larger is about 50 meters in length. A hole in the larger reef at 13 meters makes an ideal starting point from where dhonis can secure a line. All three reefs are pitted with nooks and crannies, steep ledges, overhangs and caves providing a veritable feast of marine life for divers. Some features include well-camouflaged scorpionfish on the reef top, common lionfish around the ledges, large moray eels in the caves and a thick covering of soft coral on the steep walls of the medium sized reef. Napoleon is well acquainted with divers. A school of tall-fin batfish are usually seen between the reefs, but they have been known to disappear for long periods. Schools of barracuda and trevally and the odd dog-toothed tuna are common around the reef, while in the recesses of the small reef are feather stars, oriental sweetlips, triggerfish, bannerfish, and squirrelfish. A ridge extends northward from the Thila at 22 meters, leading to a big reef that rises to eight meters. There are a couple of caves and ledges on the edge of the big reef. White-tip reef sharks are seen on either side of the ridge. 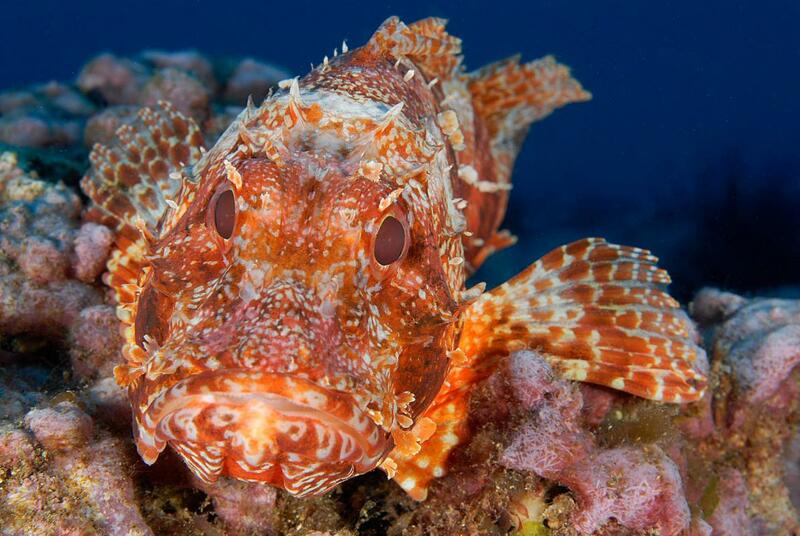 Well-camouflaged scorpionfish live on the reef top. Divers should be careful when venturing away from the Thila as it is easy to get lost in poor visibility and to run short on air. Sufficient air should be kept to return to the rope where any remaining air can be spent on top of the reef before making a slow ascent to five meters for a safety stop. At the northwestern end of Girifushi faru is Ilkka Reef. It is a thila 100m long and 30 meters wide and rises to within three meters of the surface. A smaller thila can be found 20 meters across the sand to the south. It rises to eight meters. The depth surrounding the thilas is no more than 20 meters. There are plenty of reef fish and peeking out of their burrows on the sand and rubble base are arrow dart goby and red fire dart goby. Nearby at the northern end of Girifushi faru is Potato Reef. It is located in the middle of a narrow sand saddle and is a big rock at 15 meters that is home to some grouper and moray eels. On the sand flats around Potato Reef are some stingrays. 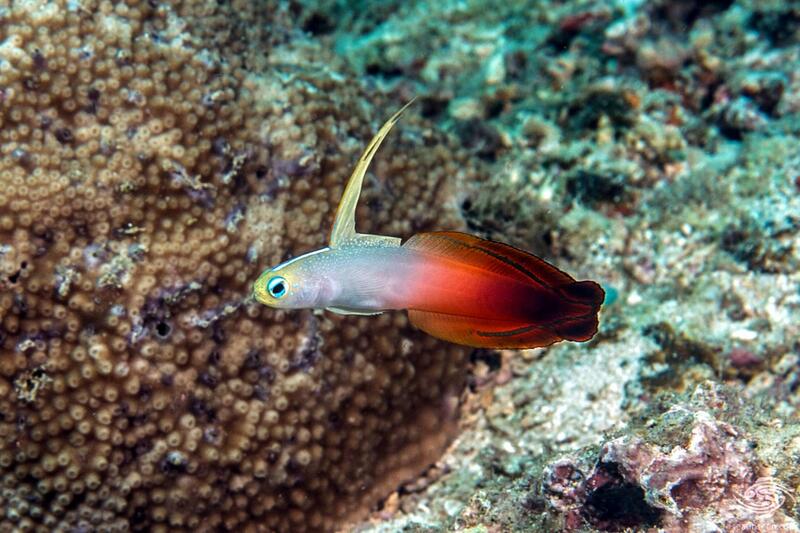 There are plenty of reef fish and peeking out of their burrows, including red fire dart goby (seen above). This is regarded by many a some of the best thilas in the North Malé Atoll. The top of the thila is between 10 and 15 meters and oval. The main attraction is several large pinnacles scattered randomly on the northeast side of the Thila. These are exposed to the full force of the currents, and a spectacular display of soft coral is all on the rock faces and overhangs. The top of the pinnacles are at depths between 18 and 25 meters and most drop away steeply on the outside. Around them are Napoleon, big-eye trevally, black snapper, red bass and a couple of great barracuda. On the main reef, long overhangs and caves between 15 and 20 meters extend almost the entire length of the eastern side. At the northern end is a cave at 20 meters with delicate blue soft coral on the ceiling and a nurse shark is often inside. At the southern end, the overhangs are full of sea fans, both small and large. On the eastern side are a shallow cave and swim-through leading to a narrow gutter which cuts through to the reef top. Here scorpionfish and tiger cowrie shells may be found. On the reef top are many species are grouper, including the large flower grouper, white-lined grouper, and peacock rock-cod. Near the reef edge at the northeastern end of several massive porite corals five meters in diameter, which is the highest point of the reef at nine meters. Small schools of snapper seem to converge at this point. With a favorable current and skilled conservation of air, a leisurely dive can be made for the entire length of the reef, weaving in and out of the coral peaks and along the overhangs before rising to the top of the reef. However, to do this within no-decompression limits, depth should be limited to around 25 meters to maximize bottom time. Divers should spend plenty of time on the reef top, making their way, if the current permits, to the more shallow porite coral at the northeastern end before making a safety stop. A parachute or safety balloon should be carried at this site. Manta Point has a world-wide reputation as being one of the most consistent sites for attracting large numbers of a manta ray. In eight meters of water on the southeast corner of Lankanfinolhu reef are several large coral rocks which mark the point where mantas converge during the south-west monsoon season. Mantas have been photographed here as early as April and as late as December. These rocks are one giant cleaner station for the mantas. 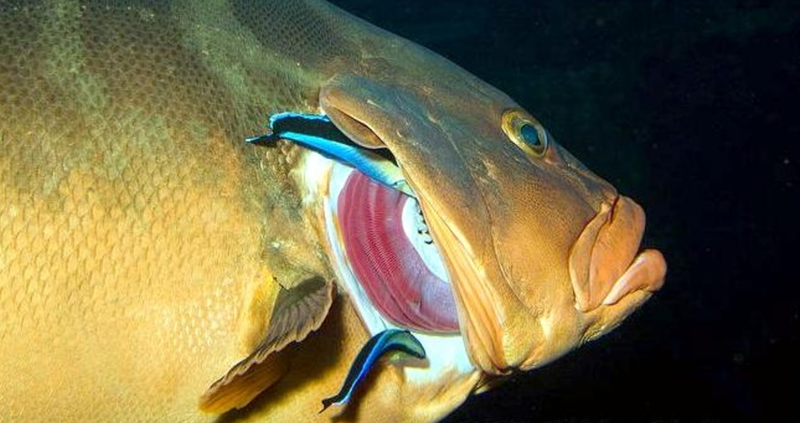 Blue-streak cleaner wrasse, Labroides dimidiatus, often working in pairs, can be observed swimming out to the hovering mantas to remove old skin and parasites. The mantas circle the rocks awaiting their turn to be cleaned, and when finished they swim gracefully up and down the reef feeding on zooplankton in the shallow water. On a sandy section at 20 meters are some white-tip reef sharks and near the southern tip of Lankanfinolhu reef is Lankan Caves. A cliff and a long cave between 10 and 15 meters mark the start. In the cave at 11 meters is a huge sea fan. A long section of overhangs and caves between five and 15 meters characterizes the southern point of the reef. 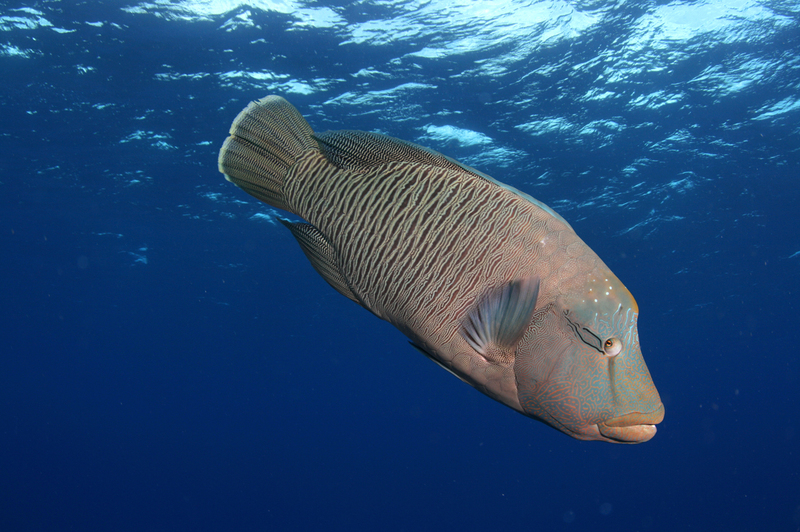 There are many parrotfish, surgeon, trevally, and emperor along this reef. On the reef, top are massive, well-formed table corals with schools of sergeant major damselfish, oriental sweetlips, Napoleon and sometimes snub-nose pompano swimming among them. A good dive plan for this reef is to dive shallow on the outside reef, hopefully, to see some mantas at the coral rocks, swim down to the sand where the white-tips are, then meet at the cave at 30 meters, come up to 10 meters with the cave and finish at the southern end. Divers are asked not to chase or harass mantas or turtles as they are easily frightened and less inclined to return in the future. 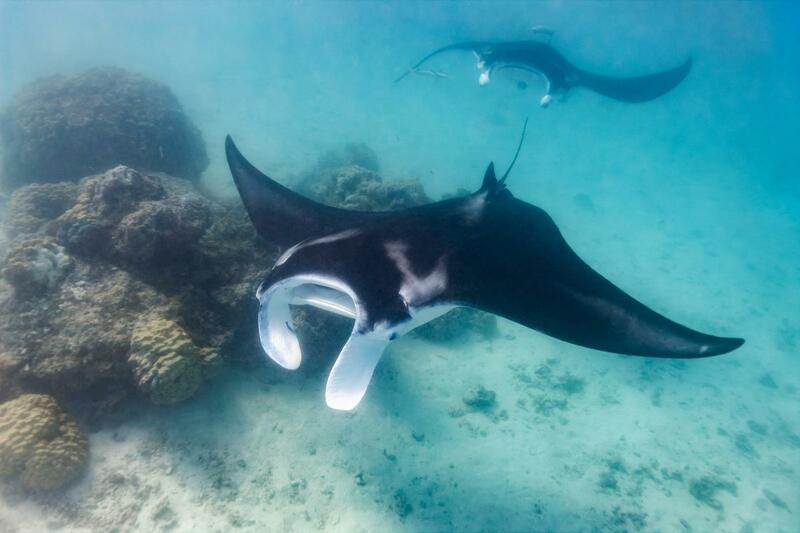 Do not hold the top of the coral rocks or the mantas may think the cleaning station is occupied. Try to stay all together at a discreet distance away. Do not swim around, stay quiet on the bottom and hold only dead coral. There are two species of manta ray commonly seen in the Maldives: the Large manta and the smaller Schooling manta. Mantas tend to be observed hovering over the cleaner stations more often when there is a current. If there is no current, they have to flap their ‘wings’ and cannot remain stationary. Mantas have no venomous spine on their tail. Male mantas have two small tube-like projections called claspers at the base of their tail. Sometimes you can observe swelling on the underbelly of the female, indicating she is pregnant. The young are born with their ‘wings’ folded. Mantas have their unique fins which extend forward to scoop up the zooplankton into their full gaping mouths. The Large manta and the smaller Schooling manta.